Sweet potato is often lumped in with the common potato, when in reality it is only distantly related to its tuberous cousin. 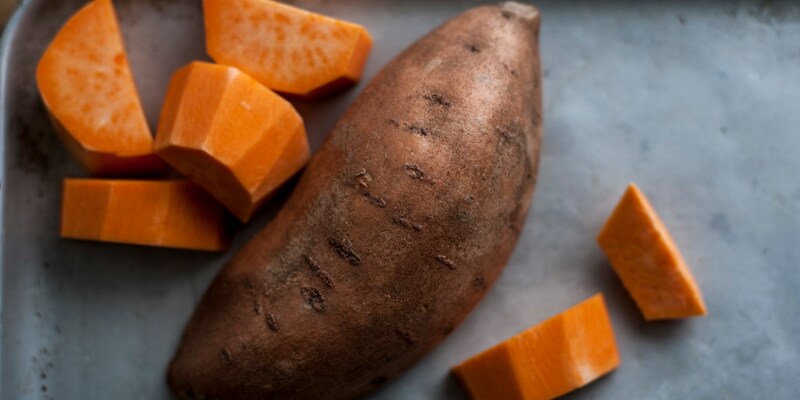 Although equally suitable for chips, crisps, roasts and mash, sweet potatoes are much more versatile, and are a staple of both sweet and savoury dishes, particularly in the Pacific where they originate from. Also prominent in the cooking of the southern states of America, sweet potato pie is often served instead of the traditional pumpkin pie for Thanksgiving and Christmas holidays, occasionally topped with melted marshmallows! Sweet potatoes with a purple skin tend to be sweeter and most suitable for desserts, whereas in Britain the most common variety is the brownish-orange variety with orange flesh, which aren't quite as sugary, but delicious none-the-less. In this sweet potato recipe collection, James Sommerin pairs sweet potato with duck, floral lavender and earthy beetroot, while Andy Waters provides a more tropical sweet potato and chicken curry recipe. Have a read of our article on how to cook sweet potatoes to find out more about the various ways in which this ingredient can be used.